Iqama is most important thing when you come Saudi Arabia on work visa. Iqama is like your identity card so you must be need to get iqama within three months or 90 days. Your employee will took expenses of your iqama if you are on company visa and if you are on free visa then you may have to pay, depends on your deal with kafeel. * What to do if iqama lost? However if you do not get iqama in 3 months / 90 days then you should have to pay 500 riyal penalty. First you go to any approved medical center in your kafeel's city / area. You can see the list of approved medical centers. Now select your nearest medical center and go for test. You need 4 passport size pictures for it. After your test you will receive a message from medical center. Forward this message to your kafeel. This report will also send directly to ministry of interior data base online and you can collect by hand too. Passport copy may be needed. You have to be insured from any authorized insurance company. I will prefer Malth insurance | 325 riyal. Test for the 1st time for issuance of Iqama (for some nationalities) includes TB Xray, HIV/AIDS test, eye sight and hearing test, a test for cholera (a charming stool sample test). Since it will be a stool test but you need to be ready. Lab Reports will sent to the MOI in this form. You will have better ideas about the medical test after go through this form. If you have Engineering visa then you need to register with Saudi Council of engineers before applying your first iqama. Kids may not need medical report for first saudi arabia iqama. A general check up like weight and height but no need of vaccination certificate. Iqama form and Sijjal tajari / company license paper. SEC registration for engineers only. Get voucher and pay 500 for one year iqama and 1000 riyal for two years and pay online or atm. Voucher to pay fee of HDR. You can pay 150 sr through atm or online banking. Your name in english on saudi arabia iqama. Your name in arabic on saudi arabia iqama. 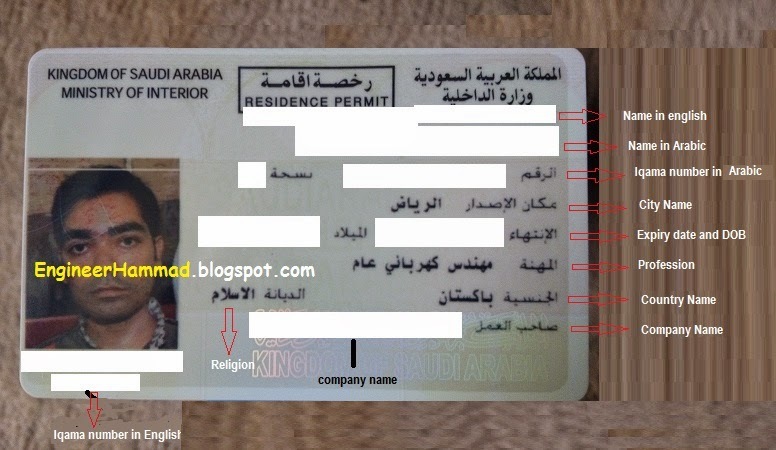 Expiry date of saudi arabia iqama. Your company name in saudi arabia. And Iqama number in english below picture on saudi arabia iqama. Sir haroob kese cancel ho ga or kya ham kafeel ko bate bager tnazal le skte hen please is par aik detaild post likh den. Is anyother way to apply temporary iqama kindly tell me plz . There is no way to apply for temporary iqama. Now a day iqama's are converted into muqeem card. And muqeem cards validity is 5 years where you have to pay fee every year. Mrs Talah, are you from pakistan? Nowadays living in Saudi Arabia as an expatriate is very tough. Too much expenses.